Material: Shearling upholstery, solid brass. Due to the nature of handmade furniture, slight variations in overall dimensions may occur. All shearling is of the highest quality but is a natural material, so variations in texture and markings may occur. 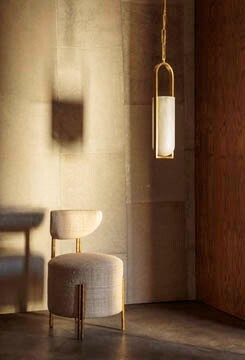 The Foot Stool is handmade from a seat of luxurious shearling mounted atop solid brass cast feet. Unexpected and eye-catching, it is perfect as an ottoman or petite seating at a vanity or console.